The accidental tourist chooses to go without a TV in his Rathmines apartment. That way, he sidesteps the trap of stasis, of still living at home just in another place. Home, he knows, should always feel different. So Stuart Lancaster reads a lot in his spare time, he listens to the radio, he walks. A farmer's son from Cumbria, he finds it strange now to think how few Irish friends he had before this. Irish acquaintances? Plenty. He played rugby for a Cumbrian selection at Ravenhill when he was just 18. He played against an Irish Students team for Scottish Students. He coached England Saxons against Ireland 'A' and of course, for four seasons, England against Ireland. So how did he see us? Honestly? Just an opponent wearing green. "You fly in, jump on a bus, go to the hotel, to the stadium, play the game, go. You'd have virtually zero time to get to know people," he says, faintly nonplussed by the superficiality of it all now. The day Leo Cullen rang, Lancaster did not even recognise the area code. They'd never met and Cullen's first question triggered the most inane answer. "Oh, just here at home..."
It was September 2016 and the truth is that Lancaster wasn't actually up to very much at all. He'd been interviewed for the Queensland Reds job in Brisbane and there was talk of Toulon showing an interest too. But the collective English response to failure at the 2015 World Cup had been so extreme, so borderline medieval, a part of him still wondered if the rest of the rugby world maybe regarded him as damaged goods. He'd just returned from a coaching stint in New Zealand, having chosen travel as the antibiotic for what that tournament plunged him into. But he was, effectively, out of work too. 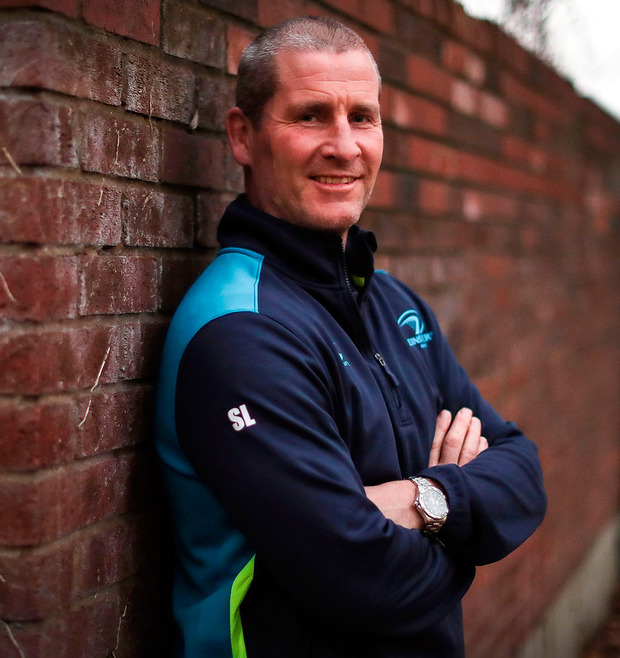 And, little more than a week after that first telephone call from Dublin, Stuart Lancaster found himself standing in the Leinster gym, "looking out at 60 faces, of which I recognise maybe 20 - the players I've coached against with England - most of them looking back at me as if to say 'What the hell's happening here?'." He was picked up off that morning's red-eye from Leeds-Bradford by Guy Easterby, pretty much just as Cullen was breaking the news to the rest of his management team. He reckons two players were also in the loop, one of them Jonathan Sexton. Lancaster had never spoken to the Leinster and Ireland out-half, yet he'd received a text during the previous week's negotiations, Sexton offering "if there's anything I can do to help get this over the line, just let me know". And that message bore a powerful resonance. At the height of the post-World Cup recrimination, Lancaster wouldn't have been human if he hadn't felt as if he was living in a circus cage. He has, naturally, little appetite for re-tracing a path through that period now, a period afforded almost iconic blackness last October with the release of a self-serving book by his former RFU colleague, Rob Andrew. Suffice to say that, come the 2016 Six Nations, Lancaster made a point of being out of the country, traveling to the southern hemisphere, "largely just to get away" as he puts it, but "also to get some perspective and balance". One of those he met on his travels was Hawthorn's Alastair Clarkson, the longest-serving head coach in the AFL. Clarkson reminded Lancaster that he himself had once been "one tackle away from losing my job" and stressed the importance of not letting "this one moment" define him as a coach. He got similar support from former Irish forwards coach Gert Smal, in Cape Town. Yet, the message that echoed loudest for Lancaster was advice he'd got from legendary Australian rugby league coach, Wayne Bennett. "Wherever you go next, make sure you 100pc want to go and they 100pc want you to come," said Bennett, now head coach with England. Which is why Sexton's message cleared all cloud from his mind. "It was only a two-line text message, but it meant a lot," Lancaster reflects now. "We'd never met, but to have someone I obviously respected so much as a player and a person do that was definitely a big factor in me coming." So too his conversations with Cullen. You see, the perception of Lancaster's role during his time with England became, broadly, that of a director of rugby. Hardly surprising given the Union had neither a CEO nor chairman at the time of his appointment. Accordingly, his days became filled with management issues and he became a coach almost in name alone. But in Cullen now he met a kindred spirit. "We're very similar in personality," he says. "Neither of us has got an ego, which means we don't have to be front and centre. We can share the load. I think you get a sixth sense about people in that situation. "With England, lots of things off the field needed sorting so I became reliant on other people to do the coaching. And I made a promise to myself after the England job to go back to what I enjoy doing most, which is running around in a tracksuit, thinking of different ways to improve the way we play the game. "I think that's why it's worked so well here. Because Leo will cover a lot of the leadership and managerial side of things as well as the coaching." His first week in Dublin, radio introduced Lancaster to the esoteric wonders of The Ploughing Championships. He loved the sense of place communicated, the clannishness, the easy eccentricity. It felt a galaxy removed from the world of honours boards and blazers and the rolling thunder of 'Swing Low...' being sung in south-west London. Yet there was the palpable frisson of a childhood connection too. His parents, John and Anne, still live on Lime Tree Farm in the small Cumbrian village of Culgaith. Older brother Stephen - having graduated out of agricultural college - still lives in the village too. Stuart, David and Fiona have built lives elsewhere, but the draw of home never disappears. His earliest memories are crowded with warm snapshots of the farm, of returning home from boarding school or college to immerse himself in menial tasks such as painting gates or spreading sileage. At 16, a mere provisional licence entitled him to drive farm machinery on public roads and the memory seems daft to him now. "You'd find yourself driving this huge tractor," he remembers, "maybe four tons of silage on the back and thinking, 'this can't be right! I've not even passed my test'." The farm was dairy and though the milking parlour was three quarters of a mile from where the cattle grazed, there was never a need for a dog to direct them on their journey. Some of the cows were so long with the family, they could have trusted them to walk up through the village and turn left into the yard without prompting. Then Foot and Mouth came in 2001, every last one of them having to be destroyed. Only now does Lancaster fully appreciate the stress that placed on home. "You'd be driving up and down the country and see these big pyres of burning carcasses," he reflects. "We were the last farm in the county. The farm next door to us didn't get Foot and Mouth. "So I can only imagine the impact on my dad personally. It was only a small farm, three farm workers on it. They'd pretty much devoted all their lives to it. "Then to see all your stock shot in front of your eyes. I probably didn't appreciate quite how much stress it was for my parents at the time, Dad in particular. "He had a problem with his heart a couple of years later and I certainly think the stress of that time contributed towards it. It was life-changing really for a lot of farmers." Study for a PE degree took Lancaster to Carnegie College in Leeds and that's where he played his rugby, qualifying for Scotland Students, U-19s and U-21s through the fact that Ann hailed from Dumfries. A hamstring torn completely off the bone ended his playing career at just 30, after which he pursued the vocation of coaching. So, 18 months ago, what did he know of Leinster? Little beyond the obvious. He is honest enough even to admit that he knew nothing of the Schools Cup system here and that, especially, has been a revelation. Because when Lancaster considers the apparent ease with which the Carberys and Larmours and Ringroses and Ryans and Leavys and Porters seem to be acclimatising to the whitest of competitive heat, he reckons the schools behind them ought really take a bow. Given his own background in English academies and player development, Lancaster is well placed to assess the health of Ireland's talent trail. "I didn't even realise the Schools Cup existed to be honest," he acknowledges candidly. "But I've really come to appreciate the quality of coaching that takes place in each and every school. "By the time they're 22 or 23, if they've made the senior team, they've fought their way through a hell of a lot to get there. They're pretty mature. The depth of talent here has surprised me." Ireland's Grand Slam win at Twickenham last weekend seemed to italicise that depth whilst also re-energising a debate in England about the load being placed on the country's elite players. Saracens, after all, will field their strongest available side for today's Premiership game with Harlequins while Cullen has opted not to use any of the Leinster players who started for Ireland in today's PRO14 game against Ospreys. Starkly contrasting preparations then for next weekend's Champions Cup quarter-final. Lancaster is loathe to pass judgment on the relationship between England's clubs and their union, saying "it's not my place", but the evidence does suggest that Ireland's centralised contract model has begun serving both club and country well. Still, he sees abundant danger in next week's visit of the defending champions, a team buttressed by many England players still hurting over Twickenham. "You know there's a bounce effect that works both ways," he stresses. "Those guys will have been looking forward to getting back with the club. They very much know the Saracens way where there's an extremely tight team and a very strong culture. And then you layer on the players who didn't get picked for England - Alex Goode, Brad Barritt, Jackson Wray, these guys. "You put them alongside Liam Williams, Sean Maitland, Schalk Burger, Schalk Brits, Will Skelton and Vincent Koch? That's a serious, serious team, very well coached. So our reward for winning six out of six (group games) is to end up with last year's European champions? Doesn't seem quite right," he says, smiling. While understanding the optimism gusting through Irish rugby, Lancaster counsels against gentle presumptions taking root now about next year's World Cup. In his view, the timing of the tournament presents difficulties for northern hemisphere teams, drawing them from pre-season into a pocket of warm-up matches before, as he puts it, "playing the games of your lives". It's not a natural fit with the traditional rhythms of the season. Of Ireland, he says flatly: "The world rankings don't lie because they're done over a significant period of time. "You don't register as second in the world without having a seriously good team. So Ireland deserve to be there. But it only takes one or two defeats by the smallest of margins and, suddenly, the perception is changed. The media scrutiny changes, the pressure on the team changes. "So I'd be thinking exactly the same as I know Joe (Schmidt) is thinking. That the only thing that really matters now is going well in Australia because that tour is fraught with challenges. Michael Cheika will have a huge point to prove in Australia's backyard and then things can change so quickly." Last January, Lancaster addressed 800 delegates at the GAA's Games Development Conference in Croke Park. He was a guest at last year's All-Ireland hurling final between Galway and Waterford, the sheer size of the amateur organisation a source of astonishment to him. His son Dan, who could play for Scotland U-18s against Ireland next week, regularly tunes into Sky's coverage of the big championship games in summer. Lancaster hopes to make Dan's game, his life as a coach having brought more separation from family than he has ever been comfortable with. "Time with my wife and kids is very important to me," he stresses, "particularly when you've put them through so much before and during the last World Cup. "I'm very conscious that my daughter (Sophie) and son are going to be leaving home soon to go to university. And I want to spend time with them before that happens because I miss a lot of moments in their lives. "My daughter passing her driving test or getting her exam results. Simple things like conversations in the car on the way to school. And I feel conflicted about that because I want to do a good job for Leinster. "I'm ambitious, I want to be a good coach. But I want to be a good parent as well."